Once a week, I try to make a totally vegetarian meal – but that does not always go to plan. 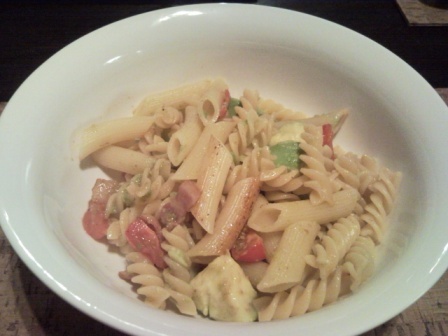 Bacon is the ingredient that mostly creeps into my vegetarian plans, and this is why I made Pasta With Tomatoes, Avocado And Bacon. I prefer to call bacon a condiment. It is an ingredient you will always find in my fridge and I really use it to flavour many dishes. I have been known to make popcorn in bacon fat. And no weekend breakfast of omelette will be without bacon. Mmmm, sounds gorgeous. With bacon or without! thanks – the bacon is an optional extra for sure. snap ! did the same last night.. found these wonderful multi-coloured twirly worley pasta at P & P and made them with roasted vegies ! wonderful. I love the multi coloured pasta’s! I am soooooo hungry right now, can you hear my tummy rumble? sending you some up right away!